This is the second day of a winter walking weekend. Here is the sister blog! At 9.30am I left my air bnb with numb feet. Snow was on the ground, there was a pink sky, and almost no-one else about. It turns out that Silverburn Park is not a secret Garden as I thought last night! I walked briskly between ploughed fields towards the sea, across the main road and through the park. 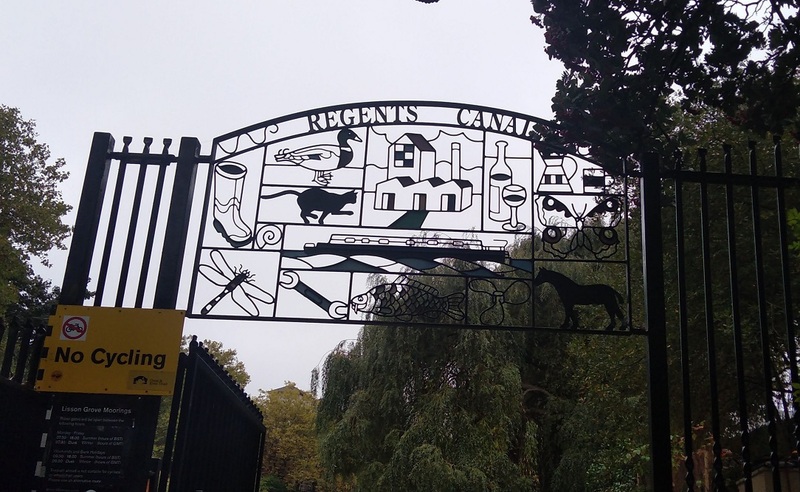 Past the sweet wee red brick cottages (not open on Sundays) I went and met the first lot of dog walkers including a woman in high heels with her breakfast hot chocolate. By time got to the beach (10.15am) my toes were all but thawed but I was walking slower than usual on account of a dodgy left knee. Joggers went past and dogs were constantly barking and disturbing my peace. The tide was way out revealing water with a smooth metallic look about it. It was the light catching the shallows sands which was so beautiful. Wind was on my right cheek today, rather than heat, as I made my way eastwards along the coast. Mountain bikers took the path well trodden. I went across streets which were treacherously icy with puddles deeply frozen, and the only sign of the sun was the pink rim on the eastern horizon. As I swung forwards I surveyed the changed shoreline with its diagonal black rocks familiar from stage 2. Then straight on I went, past the orange house where a white-haired saunterer in shorts returned from getting the morning paper. Readers of my blog know that I love my shorts but not in this weather! Lower Largo is a very pretty village with brightly painted doors and model yachts in windows. Alexander Selkirk, mariner, is the original Robinson Crusoe, who lived in solitude on the island of Juan Fernandez for 4 years and 4 months. It has to be said that it was all a little bleak this morning with only a weak sun. Multi-coloured rocks and bright green pebbles with shiny brown seaweed and opaque glass pieces could be found along the shore. Oyster catchers were peeping and others trilling. 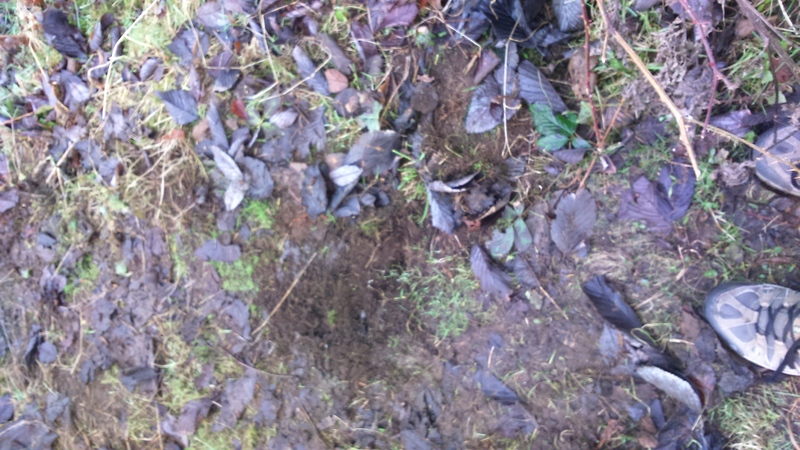 A couple held hands and battered shells littered the ground. It was a hard walk in a good stretch of nature. I saw a couple of thrushes and a tall, friendly man with a ruddy face. His long-legged red setter had a neon tennis ball clamped in its jaws as we crossed the Dumbarnie Links Nature Reserve. Here there were raven-esque, empty mussel caskets (I was directly opposite the town of Musselburgh!) and I felt melancholy. It was what I call wonky walking where one of my feet is on higher ground than the other. The strand stretched out ahead and while gulls swooped, black and white waders dipped orange beaks. Berwick Law in East Lothian to the south, was snow covered too. Here was only one other human in sight. There seemed to be miles of those lumpy sea creatures’ corpses, all rubbery, and simply trillions of shells on their way to becoming sand creating quite a different crunch underfoot compared with the ice and snow. 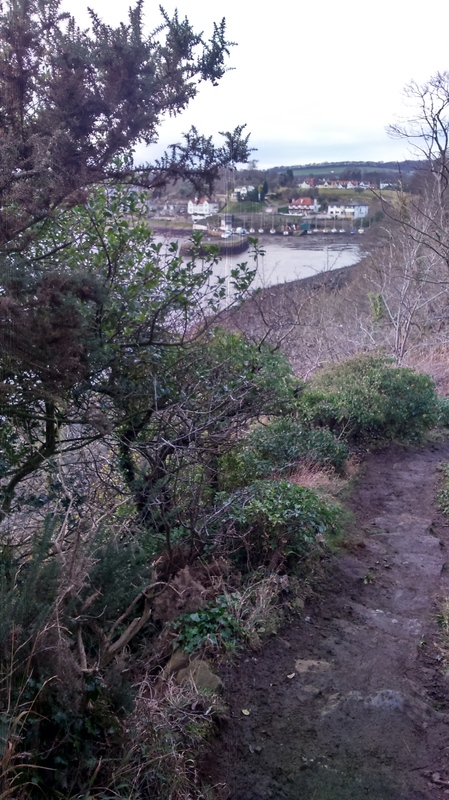 To follow this part of the coastal path, just keep walking along the beach before a long line of dark green trees with appear across your view. Then you will see a sign to the left heralding a change of terrain. A World War II look-out post – what a cold job that must have been! Up and over the cliffs runs the way, some roughness and muddyness, steep but not very high. Sadly I missed the part where there is a chain to climb up. Apparently people have died so on second thoughts that was probably a good thing, although being me I would have liked the challenge. Around 1.30pm I arrived at Elie beach with its yellow brown sand and a headless seal. People were foraging for cockles and a feathered wren hopped by my side. The next urbanisation, Earlsferry, seemed to be a well-to-do area with mansion turrets and BMWs all over the place. There is a library and care home but no shops or pubs. The sky was fair lowering (getting dark – looks like rain!) and I was getting hungry, so I took a detour until I spied a golf club and the Pavillon Cafe which was busy. What incredible luck as ever! Inside I not only found warmth, hot victuals and a distinct lack of wind, but I unexpectedly spotted a familiar face. I ordered my food and said ‘Hi’ to a colleague from long ago. We struck up a conversation and with true kindness he and his partner announced that they lived in St Monan’s (my destination) and asked if I would like to stay the night. I gratefully accepted because I had nowhere booked and transport back to Edinburgh from small Fife villages is hard to find on a Sunday evening. I declined a lift though, and made my way back out into the slightly rainy and dull afternoon (3.15pm) with a cosy tummy and glowing heart. There’s a great story here about Lady Janet’s sea bathing! The last stretch is full of interest : a lighthouse and a palace, two castles (Newark and St Monans), divers ruins and a famous church (but it was too dark for a photo). 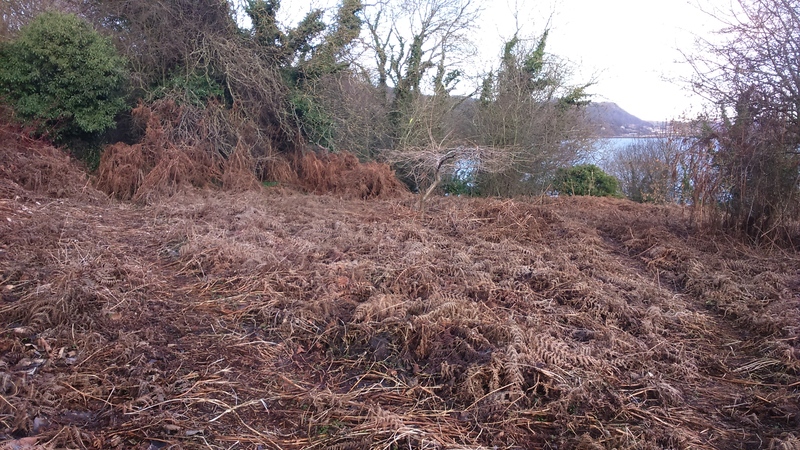 With wilder, darkening waves pounding I walked through pinkish bracken and I approached St Monans around the fields, arriving as the day the darkened at 5pm. What a pretty village! I was really taken with it. I am told that the East Pier Smokehouse is well worth a visit, however it is shut between October and June. 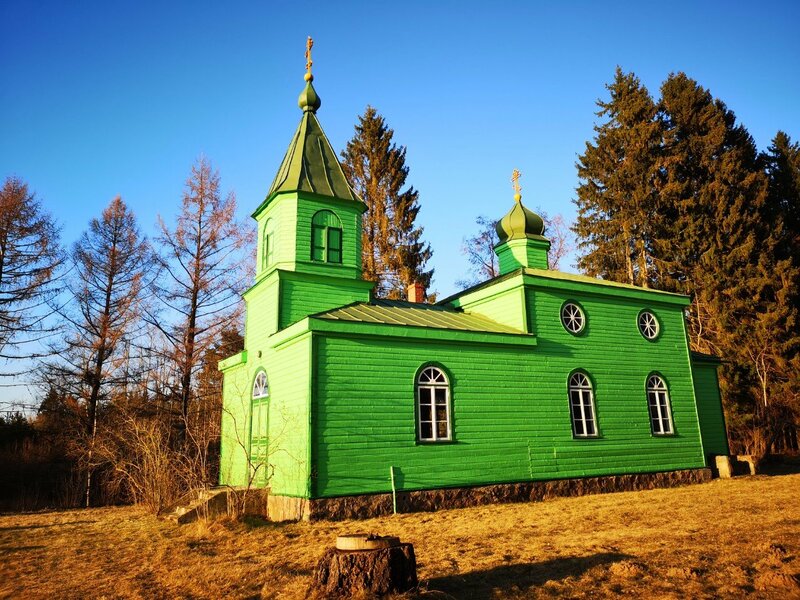 There is famous parish church and a Heritage Collection. The hotel I saw was also shut in the winter months so it’s a good thing there are air bnb’s nowadays and Margaret’s sounded great when I made enquiries. I was lucky and stayed with J and J whom I had fortuitously met earlier and had a lovely evening and comfy bed. I travelled back by car with J to Kirkcaldy station across the flat lands as dawn revealed another wintry sky. Then we got the train to Waverley Station in Edinburgh. To get back to Edinburgh from St Monans by bus would cost £10 with a change at Leven and it takes ages. Sometimes when I walk I crunch, sometimes my footsteps thud on the grass or whisper on sand. Occasionally there is a rumble of small stones or snap of stick, splinter of ice, even hollow bump into the peat or squelch because of the wetness. These things I notice as I walk the paths of Fife early in the year. Fife Coastal Path, Scotland. Stage 3, East Wemyss to Lundin Links 11.5kms. 3.5 hours. Stagecoach Edinburgh Bus Station (also other starting points) to East Wemys (there’s only one stop) £10 single, very prompt, 2 hours. I am trying to maintain my strength for the longer walks in Spring carrying a heavy rucksack, plus I wanted to be able to write in the evenings, so I took my old laptop. (Thanks to Gustaf at the Wild Geese Sangha for the prompt to do less kilometres (after all, it is winter). The Walk Highlands website lists these stages as short anyway. Just as I left I spotted my new baton. I have been training myself to act on these intuitive moments so took it just in case, and that turned out to be a good move. Before the bus stop I was already feeling the familiar relaxing bubble of excitement in my tummy knowing I would be walking all weekend. It just seems to suit me, this particular pursuit! A woman who also had a pink rucksack was waiting and we struck up a conversation. She was travelling to Carlisle to present her PhD on lichen (she works at the Edinburgh Botanic Gardens). I mentioned a good novel about botany and moss where many of the characters spend a great deal of time on their knees at ground level. ‘The world had scaled itself down into endless inches of possibility,’ (Elizabeth Gilbert’s The Signature of All Things). Snow on the ground and the sea to my right as I walked east to west. When walking I become fascinated by the small things and in the dark morning the pavements were sparkling with ice. After yesterday’s amber weather warning I did wonder if it was perhaps foolhardy, but being used to solo mountain treks and the fact that this track is never far from a conurbation it seemed worth starting. And the birds were in full voice and the Edinburgh skyline was very pretty. I tried to meditate on the journey but was itching to start so it seemed to take a very long time. Then again, crossing the Firth of Forth at sunrise was special and the views through the (sadly darkened) coach windows were spectacular. As I made my way down from the primary school in East Wemyss to the sea, past a dainty church in a snowy graveyard, the sun was dim behind soft cloud cover. Then gaps revealed patches of blue sky and they were reflected in the sea. I had arrived, back on the Way, soft snow puff and crunch cold ice under my feet, clean air in my nostrils, starlings arguing, and street with names like ‘Back Dykes’. Seagulls fought over fish in mid air, gravestones were silhouetted up on the hill, and industrial reminders lay ahead cheek by jowl with more recent wind turbines. Thanks to the black clad man (with identically coloured dog) who rather reluctantly helped me get my water bottle into the side pocket of my rucksack. Some of the path is along the route of the old railway. 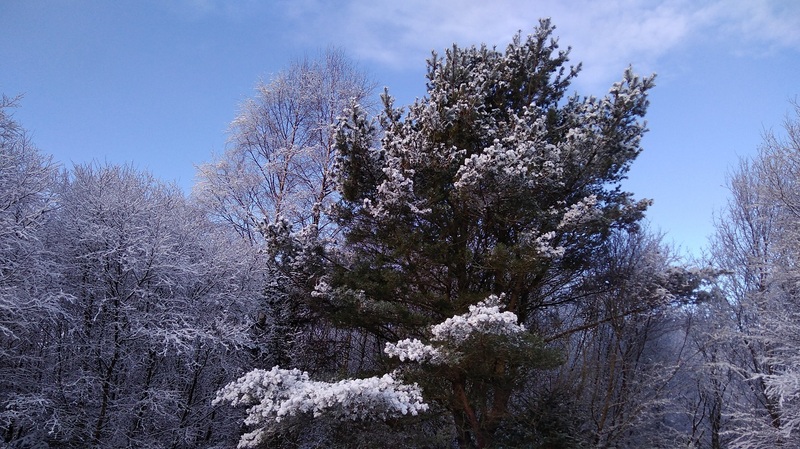 The sun continued to shine and the snow sparkled. The gorse’s corn kernals glowed, and soon the first steep steps ascended and descended with Macduff’s Castle at the top. I took a détour to visit the caves. Here was the first of the famous Wemyss Caves with its warning sign which in fact could be ‘dance’ not ‘danger’. Pigeons cooed as they flapped in and out of the doo (dove) holes in the second cave. Soft stone tones – rose, gold, pale pewter – and a low winter sun threw my shadows. Carvings – old and new – in these Neolithic caverns. Although there were seriously snowy hills behind me, underfoot was variously green and white depending on the shade. It was quiet here, well, except for the birds which sqwarked and twittered and ‘arrgh-ed’ and trilled. Indeed, they cawed and cheep cheep cheeped, just like they are supposed to. Instead of retracing my steps as directed, I took a left past this tree. Macduff’s Castle – from the 14th century – is supposed to be haunted by the ‘Grey Lady, Mary Sibbald. According to Wikipedia, Randolph Wemyss was a descendant of Macduff, as well as the local laird and mine owner. Matching: the monument above, and more caves below. Is this the name of my true-love-to-be? A robin sat silently and showed off his orange breast in the sunshine. He was camouflaged perfectly with the orange pink stone. Out to sea were the Bass Rock (its puffins too small to be seen), oil riggs, and Berwick Law, the only high ground on that stretch of the opposite shore. Land and sea birds’ voices competed. As soon as I zipped my camera in my pocket, out it had to come again because it was all just so bonny. 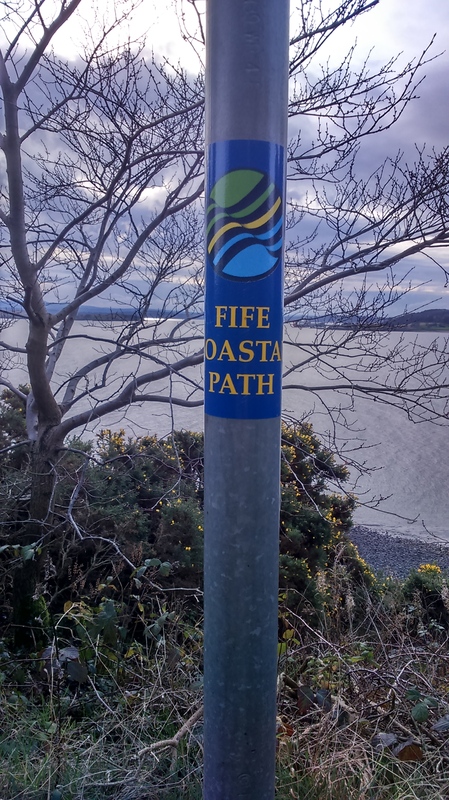 The Fife Coastal Path logo, found all along the way. Helpful hint: zip up your pockets every single time in case you lose something vital and have to go back to search. I felt extremely happy, and even nervous Hugo (the little grey dog who waited for me to go past and made a snorty sneezing noise) could not change that. I noted that, like pregnant tummies, everyone pats dogs when they are out walking. They are so abundant that I chose the name ‘Walking Without A Dog’ for my Scottish blog (rather than ‘Walking Without A Donkey’ which is the overall title of my foreign ones) because I do not have one. Of course the snow throws everything into brilliant relief, the blackbird in the leaf-less branches is always visible at this time of year, and the old nests are exposed. Brambles tickled as they caught my hand. The fields curved smoothly. To the left side were rooves of distant dolls houses which frontages I fancied I could open for spying on the family inside. A jut of headland was beyond, with its black foundation below and green lawn layer on top: Buckhaven. Gentle steps were sensible because it was very slippy in places. Remember to turn right here, as instructed. Do not go straight on as I did (where there were diggers and, ‘aargh!’ traffic noise) and then have to go back…. 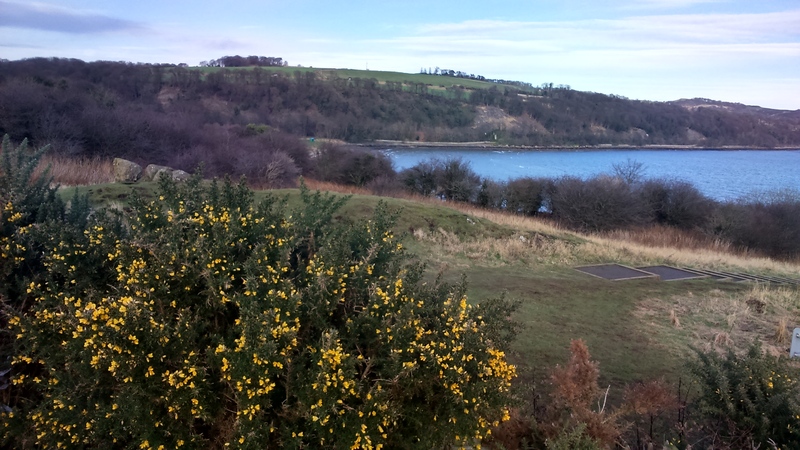 …or you will miss Buckhaven harbour and brae where ‘the hawthorn supports 200 different species of insects’ alone (from the info board). My kneecaps were bothering me and I had to take my gloves off to relieve the sweatyness, but just look at the view! There were higgeldy piggeldy boats houses, and copious signs telling you about the bay and fishing. St James stood in someone’s front garden and welcomed me . A reminder of my caminos (Spanish for Way) to Santiago de Compostella where some of the remains of St James are interred. They are really trying hard in Buckhaven, providing a good range of services: bank, post office, shops, bakery/cafe and lots of butchers along its wide main road (initially made like that for the tram lines which were lifted in 1936 to make way for the more popular buses), though much was shut on this Saturday morning. Yellow and pink icing for the apple turnovers, and yes, those really are baked beans on top of the pies. Traditional Scottish fare! When I emerged, fortified by my cup of tea, I smelled not just fresh air but snow too. There is a Heritage Trail here and one oval sign explains that the community orchard was started from apple cores thrown by the Globe cinema goers (1921-50s) or railway travellers (1888-1955). At the far edge of Buckhaven the Wellesley Colliery, or what remains of it, can be found, looking really rather grand and shiny in this weather. The surprisingly beautiful structures of the disused Wellesley colliery which has been ‘closed for years’ said the woman I asked. Great giants are toppled, sharing the space with an example of the newer wind turbine (here owned by ORE, Offshore Renewable Energy, a not-for-profit company and used for research purposes). There is no trace of the even earlier salt panning industry. Even these few left-over buildings dominate, and it’s not hard to understand the devastation that Margaret Thatcher’s government wreaked when they were closed in the 80s. (A similar situation in Northern England is well portrayed in the film Billy Elliot directed by Stephen Daldry.) Tellingly, as so many died underground, Denbeath Funeralcare is over the road. There are rows of the sorts of cottages which have become expensive in today’s housing market, similar to ones in Granton which we thought must have been for the workers but no, they would not have been able to afford them. They were actually for the bosses, or at least the ‘middle management ‘. There is a molten candlewaxy smell and a factory has replaced the mine with something more chemical. As I round the corner the sign on the warehouse says ‘Fab’ and tower blocks and roundabouts are the order of the day. The ice is starting to melt, trickling down drains, and my stick taps on the bare pavement. People complain about this stage of the walk because of the long stretch through towns and villages, but it’s alive with the real history of the area and not too ugly in this sunny moment. Next: Methil with its docks. I easily amused myself during the long stretch of tarmac by likening splodges on the ground to jellyfish, and swinging my cane like Mr Banks in the happy bit of the film, Mary Poppins. Everywhere looks good in the sun, even the garish pink house with the gold railings, and I enjoyed the cacophony of sparrows (if that is not the collective name then it certainly should be). Then, over the river to Leven. The River Leven beside which a gentleman was rooting around intently with a long branch. In Spain they have elaborate art work and enormous signs in the middle of roundabouts. In Edinburgh they are hoping to turn Picardy Place roundabout into a ‘gateway to the World Heritage Site’. Here there is a miniscule advert for safety boots and footwear. ‘Leven Welcomes You’ with its three steeples set against the decent sized, snow covered Largo Law (hill). The tall chimney mentioned in the directions I was using had indeed disappeared. At 12 noon I felt the first sign of weariness. A spider-legged, hooded youth wafted past in a cloud of strong aftershave, and then I was finally back to bingo and beach. I found myself disapproving of a man smoking in a car with a baby in the back, and my back was aching. It was not a proper hiking backpack having no upper strap, and that was where I was feeling it, at the top vertebrae. I had to pay 30p for the toilet and kids were screaming relentlessly in the neighbouring Action Centre. Ah, see my mood? I must be hungry. The azure sky mimics the sea. Can you spot the upturned shopping trolley? The further I went from the town, the more the landscape became sand, stones and the sound of lapping waves. Really it did! There was a reassuring briny odour as I traipsed 1.5 kms of strand, which made up for the caravan park’s monotonous green cabins. Unattractive but perfectly situated holiday park. There were none of the sea stacks of stage 2, nor the rock formation; simply uninterrupted sandy heaven, and watching other people’s dogs caper in the waves. The sea was leaving its tracks behind. Walking across these sands towards Bass rock was like my entry to Mont Saint Michel. Despite the time of year, I slept here on the grass because it was too early to go to the air bnb, and I had my snack, the sun warm on my face. Walking back in the direction from whence I had come, all was quiet inside. Only occasional practicalities took me from my pacing: a runny nose in the wind, the water bottle falling out as I crawled under the fence, or a song from yesterday’s choir repeating in my head. Must I take short cuts? At this time of the day I often find that I do, yes. I was following google maps to my destination. Surely, I thought, I can just go across here instead of all the way round? So I crossed Lundin Links with its soft feminine curves of virgin snow. The ends of the bunkers which faced south were greener, each with its own rake. But three times I came to a dead end. Luckily, not only was everywhere interesting and beautiful to survey, but I discovered unexpected gems: Silverburn Park with its hidden garden, pebble walled paths and frozen pond. Through the windows to a winter wonderland. What a contrast to the beach and the snow scenes! The iced pond made for a strange perspective between the trees catching the sun. When I found myself stuck, I asked folk the way: two men with far-away dogs and hi-vis jackets were helpful, indeed one gave me a ‘bunk-up’ across the cemetery wall, despite my boots and his bare hands. My host had texted me ‘I wouldn’t advise walking up the main road there’s no paths and can be a fast road. There’s a glen called “letham glen” it’s lovely ! Walk though the glen and up the hill. Turn right and follow the path and your here!’ (sic). The best air bnb owners share local knowledge and are helpful like this. The brilliantly named Bawbee Bridge was near my penultimate destination: Letham Glen where six grown lads were engaged in a lively snowball fight while their broad Fife accents overlapped excitedly. Initially the Glen is all about children playing, but deeper into the woods there are quaint stone bridges over babbling burns and although there was no real wildness on this hike, here was some ‘Deep peace of the running wave..’ (Gaelic Blessing set to music by Rutter. See below). Sledging on a Saturday afternoon. The bronze light set a backdrop for this wintry gentleman. Largo Law (hill) is a permanent feature along this part of the Fife Coastal Path and in the late afternoon, as I negotiated today’s final stage, it was on fire. You can just see Largo Law in the distance in the stunning bronze light from the setting sun. I stayed at the Country Farm House with Caroline and Will, Lexie the dog and Lucy the cat, and they could not have been more kind and obliging. The evening meal and breakfast were home prepared, and the bread and butter pudding with Baileys and After Eights was delicious. Look out for Caroline’s cuisine at Ladybank Golf Club where she has recently won the catering contract. I highly recommend their facilities, and if you own and love horses you will be in heaven because you can bring them for a sleep-over here and take them for beach rambles while you are treated to an idyllic rural break. A dander along the Fife coast from Burntisland at low tide 9.15am to East Wemyss at high tide 3.45pm. Twelth Night – 6th January 2018. 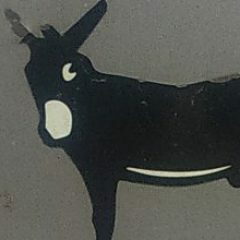 Fife, the shape of a (Scottish) terrier’s head. Fantastically well signposted (almost impossible to get lost if you pay attention). Distance: 19.5 kilometres (12.25 miles). Duration: the website said 4.5 – 5.5 hours, but if you have short legs and are out of practice (or both), and want to stop to take photos and have a cup of tea etc, then it takes longer. I took the 8.39 train from Edinburgh. Burntisland with pink buildings to rival Austria (almost). 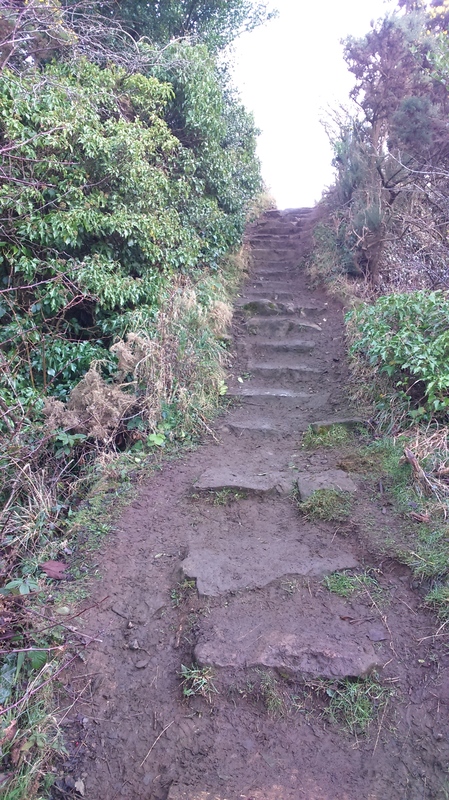 Terrain: mostly flat: there are a few sets of steps (ascending and descending), and a couple of sloping roads (out of Kirkcaldy, for example). There is some tarmac, but it is chiefly sand, grass, small stones and once (I am sure you could avoid it) a great tumble of rocks. In real life the rocks are actually black, so contrasting with the yellow gorse or whin. The tips of the sharp grasses are prickly in these ‘botanically important areas’. Ringlets of old man’s beard. 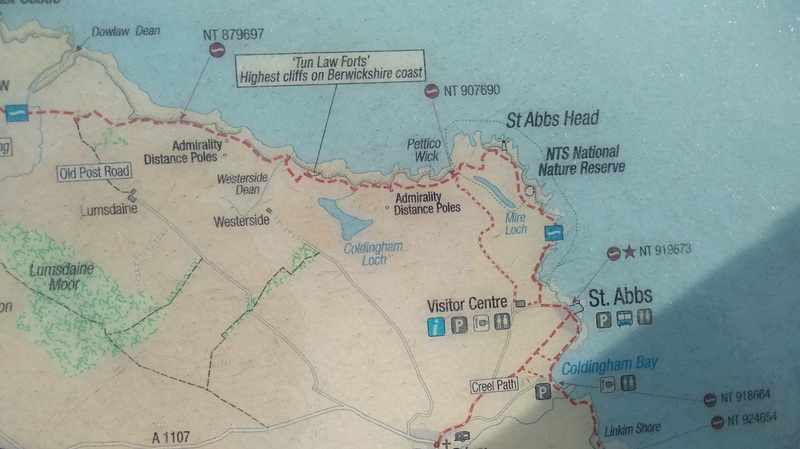 Linking the Forth and Tay Estuaries (Kincardine to Newburgh), the Fife Coastal Path runs for over 183km (117 or 105 miles according to different websites), through the varied landscapes of Fife. The route links some of Scotland’s most picturesque former fishing villages as well as the home of golf – St Andrews with its ancient University. 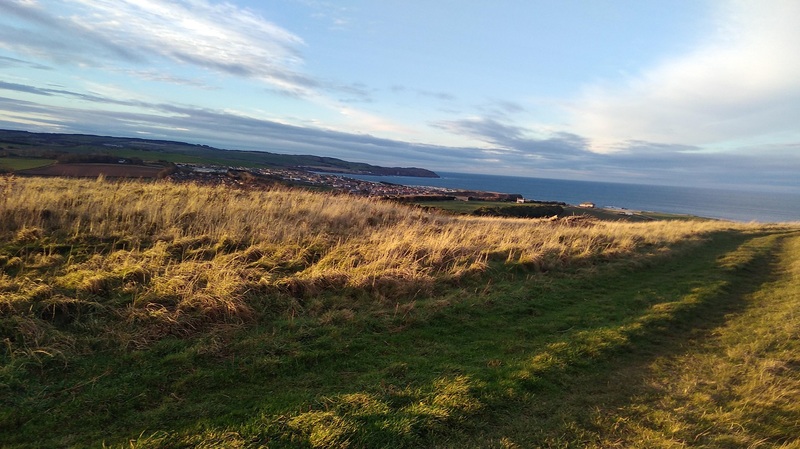 In between are miles of golden beaches, attractive woods and nature reserves but the route also threads its way through industrial towns such as Kirkcaldy and Leven. History is everywhere, from the winding gear of the former coalyards (see below) to ruined castles and the pictish and prehistoric carvings in the Wemyss caves. (Mostly taken from Walking Highlands, with info from Fife Coastal Path and Birding the Fife Coast). Stunning beaches along the Fife Coastal Path. I started at Burntisland, opposite my house on the other side of the Firth of Forth, regularly spied through my binoculars on a sunny day. A ferry used to run between the two. Too high for me to get a readable photo: it says ‘..station opened 1847..with a ferry to Granton (my home harbour) and thence by train to Edinburgh. The world’s first train ferry service started on this route in 1850. 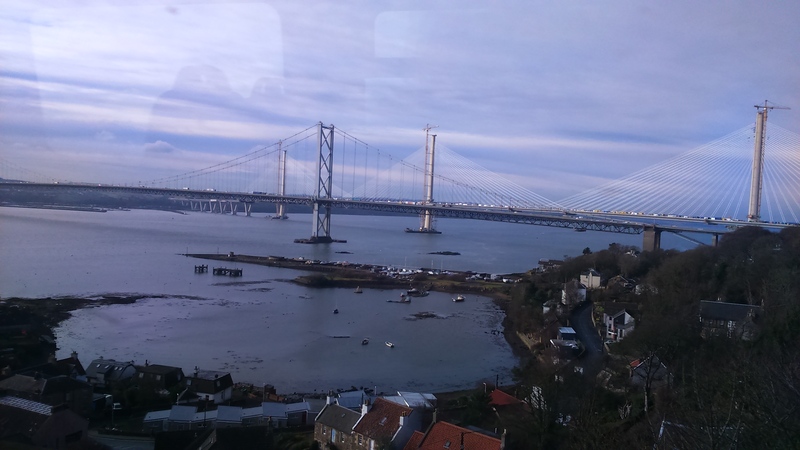 It ended in 1890 when The Forth Bridge opened with a new link line to Burntisland…’. 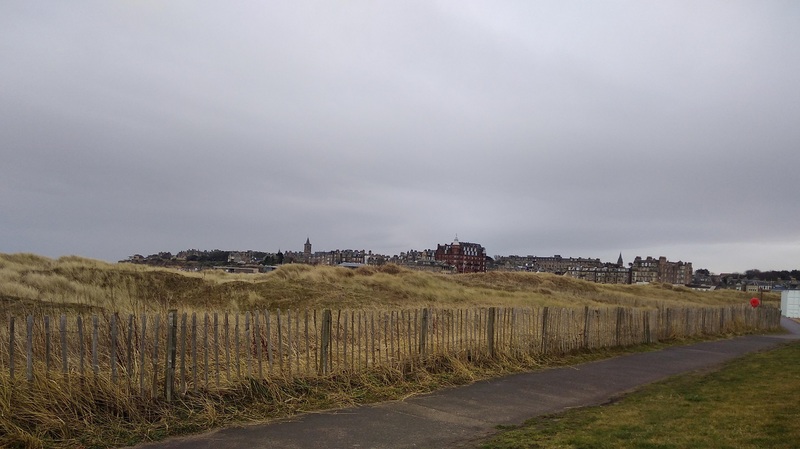 A few minutes from the station, the path begins near the links (links are green spaces in Scottish places, often on the dunes and used for golf courses). Straight down to the beach, I was going briskly to keep warm and happy to watch the dogs, spot shells (razors which I tasted for the first time in Santiago de Compostella at the end of the Camino Frances, cockles and the odd strongbow can.) All who passed wished a good morning, and that it was. A range of shells on the beach. The path runs adjacent to the railway with its occassional very short trains and fumes punctuating my rural idyll. A bubble of joy was in me to be setting off on a hike again. The railway line, always there beside the path, glimpsed through the railings. The sun’s slanting rays emanated through the clouds – what a great antidote to doing the end-of-year accounts! I chose the low tide route across the grass littered with droppings (deer? rabbit?). There was a sea odour; a raven with its dipped, dull head; the plaintive cry of the gull and peeping of the oyster catcher. Ahead was an obstacle and, immediately, boulders to clambering over. That definitely raised the body temperature. Anyone who follows my exploits knows this is business as usual, and it did not last long. The scarlet gash of a kite: what a brilliant Saturday morning de-stressor from a sedentary day job. After pacing the pavements of the city the sand was oh-so-soft away from it all. Here was Petycur Caravan Site whose windows catch the sun so I can see them from my sitting room. There is the constant background sound of the most attractive white horses rolling onto the edge of the beach. My peace is interrupted by a train or car, but otherwise I can focus on the wonderful sands and the marks of the dog who had been there before me. With a quietening in my belly I surveyed the uncreased sands. Kinghorn is the first of the dainty villages with its 5 or 6 boats tucked into the first harbour. Round the corner is a second with a lifeboat and pretty church. There is a smell of chips as I pass the cafe and another jolly greeting from those sitting outside at 10.40am. 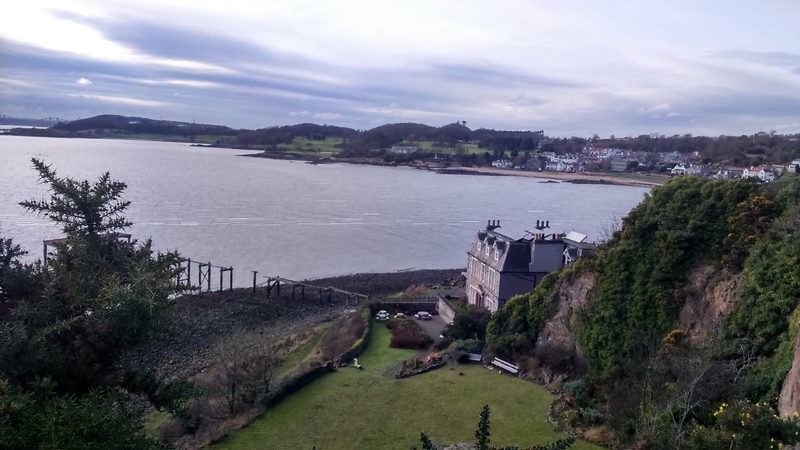 What a fantastic place for a holiday here in Kinghorn with its beach side bed and breakfasts – all pretty and welcoming. 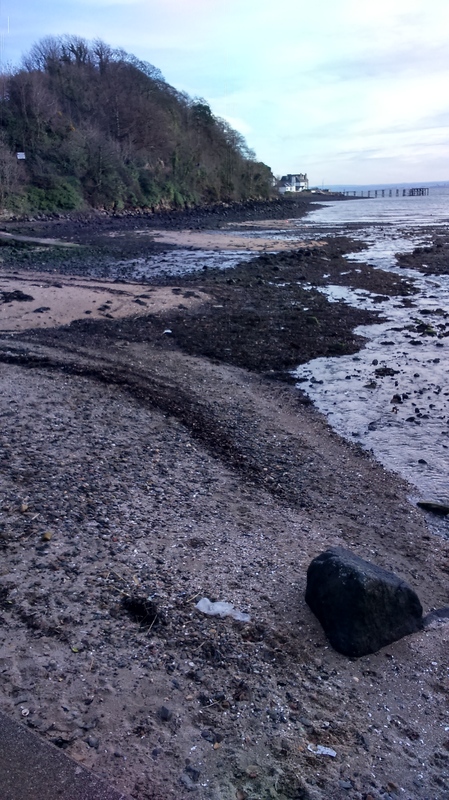 It turns out that you can skip the ‘A’ road mentioned in the directions as I did, and get all the way here by beach, but you would miss the monument to Alexander III ‘who fell to his death nearby in the 13th century.’ (Fife Coastal Path website – see below for the link). The sand along the coast is black as well as golden, a reference to the once profitable, now plundered coal seams of this area. 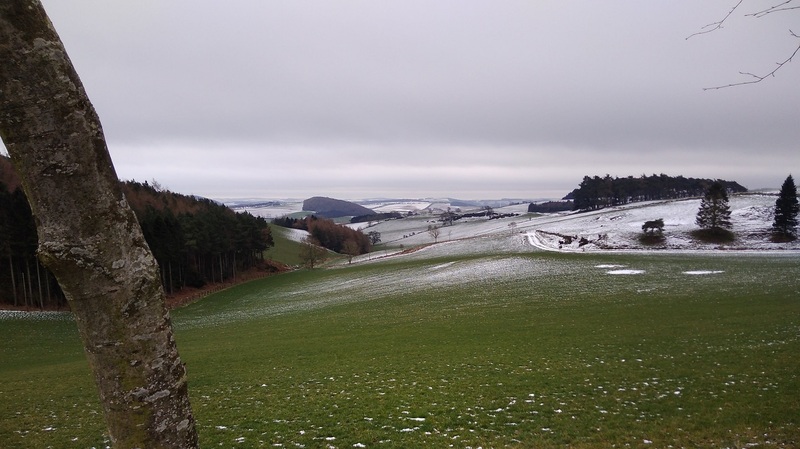 I glory in the muted palette of winter, similar but different to the Yorkshire Dales I walked 2 weeks ago. ‘Black Gold’ (coal dust), a remnant of the past industry. Out at sea are the ubiquitous oil riggs and red bottomed tankers. On land the municipal toilets are shut for the season. Perhaps, I wonder, I should have paid 30p at the last ones. There are lots of folk around so I cannae squat now! Two oil rigs and a tanker inbetween. The path is well waymarked but I get very easily waylaid by views and ideas when I walk. The path moves away from the coast here under the aforementioned railway into a playpark, and through a little tunnel. It was nose-running weather but as per normal I was lucky – no rain and not too much wind though it was very cold even when the sun came out in the last third of the day. Men from the train passed, going in the opposite direction. I stood aside and one kind one said ‘we are making you walk on the grass, go on, you go past’. What a sweetie. The increasingly beautiful scenes meant I just could not stop taking photos. My weight felt heavy on the ground now and it was lovely. More tramping than skittering as at the start. Here was the promised rugged coastline with its horizontal striations of gentle sandstone, pillowed volcanic rock, columnar jointing of basalt and great hunks of black volcanic dolerite (a reminder of an eruption of The Binn volcano over 300 million years ago). A gentle incline led to a sunny path and the blue sky was reflected in the rock pools below. Real crowds of ramblers went by, and whereas the local people were friendly to a one, those from Edinburgh were not all, especially the women. There was Seafield Tower in the distance. I listened to the unknown, feathered singer of dee doh dee doh dee doh dee doh deee. And Seafield Tower close up. 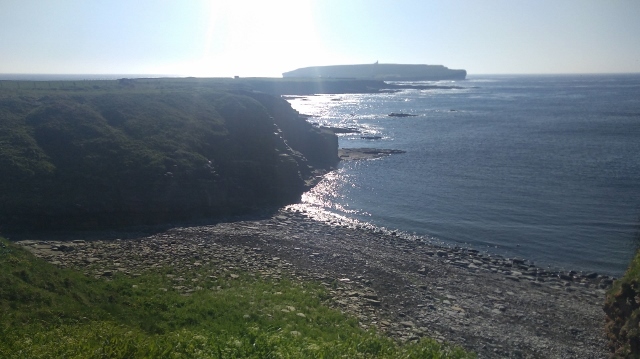 This tall beige and tan, broken 16th century castle with its 5 feet thick walls, stands above the beach where happy hounds bounce in the sea air, and there was a long legged, curved-beaked curlew at the waters edge. The chunks of rock cubes and parallelograms, the regular flat-topped mini cliffs of Dover, and occasional man-made stacks of concrete were all fascinating. Kirkcaldy was ahead with its three blocks of flats showing up their white frontages in the sun. This poster was on the outside toilet wall and wholeheartedly subscribed to during my wanderings. Unless, that is, I have given Shiatsu, when a deep sense of relaxation is a happy thing to have left. Walking over bumpy terrain is reputedly good for the brain. http://mxplx.com/meme/2622/ Plus, the inner ear has to constantly re-balance. My legs are starting to feel heavier but I am so glad this will not end soon. I pass through the three quarters circular metal gate (a contrast to the stiles with tiny wooden ones in the Yorkshire Dales) into the Seafield carpark where there is a woman in her nighty and white ankle socks walking her dog. A man with purple lips at the end of his constitutional makes pithy conversation: ‘That’s a good walk that is’, he said, when I regaled him with my route, ‘I was a member of the Ramblers. Walked all over Britain we did.’ He corrected my pronunciation of Wemyss (say ‘weems’). ‘There’s a cafe in Dysart’ (say ‘die sut’) he went on ‘and toilets’. A fount of local information he was. Each tiny stile also has a mini gate to pass through in the Yorkshire Dales. Whereas in Fife, it was this more mechanical one. I made it to ‘The lang toun’ (meaning, the long town, which Kirkcaldy is known as) just after midday. There was the Raith Rovers football ground and a Morrisons. It is a large sprawl with inevitable industrial outskirts, space-age covered esplanade seats, and a weird public sculpture. I popped into Lidl for chocolate and a free pee where I saw what rosy cheeks I had developed from the wind. Then the way resumed by the really extreme sea wall of white concrete blocks which was a project for relieving unemployment in the Great Trade Depression of 1922/23. The Link Sands were softer, again, for my feet but with a smell of, what was it, chutney? The Hutchison’s flour mill is like our very own Chancellot Mills in Newhaven, Edinburgh, and rows of birds made a dotted silhouette on its roof like decorative braid. There was an unpleasant, burning plastic smell. Past ‘Ultimate Reptiles’ and hideous car parks I went, past the derelict Nairn Floor Cloth Manufactory (1847) which facade hid a modern place to learn fighting, and steeply up past the Nether Street cemetery into the spacious Ravenscraig Park with its Three Tree Legend. Apparently the three trees were planted over the graves of the trio of Sinclair brothers who, mistaking each other for robbers, killed the other. The dark shot of the nearby castle (built by James II for his wife Mary of Guelders) and bay behind was suitably sinister. A Gothic looking, ‘Northanger Abbey’ type castle. There was an option here to go by the beach instead of following the signs, but this would have been missed. 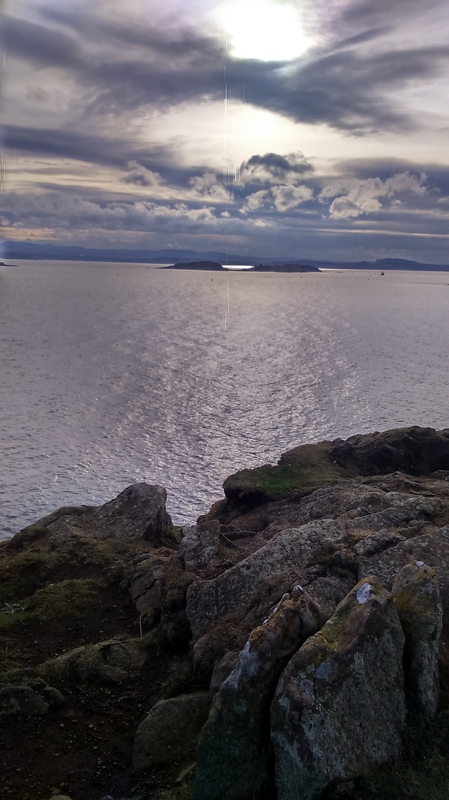 The sun’s rays splayed out over ripples of the rounded bay and in the distance the hills of Edinburgh showed in varying shades of grey, all lit up behind a path of silver sea. Stone art comes next, situated amongst foot-crunching beech husks. 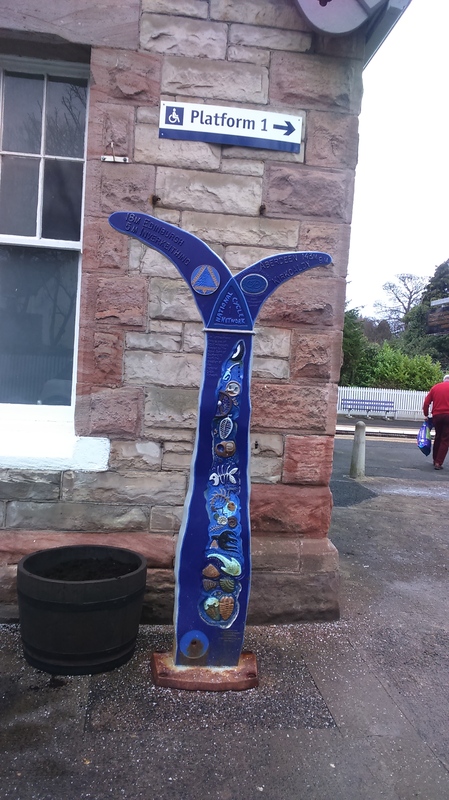 It is by Kenny Munro and features the poem Stanes by Duncan Glen (who ‘fittingly ascribes his achievements to his wife Margaret of 51 years’) with ‘Scots words [which] allude to the many stone features around us.’ (Quotes from the information sign nearby). There is also a doocot (dovecot) which provided the king and his court with meat. Next are a series of little coves divided by what look like noble curved walls. Many are entered through tumbledown arches and are seriously narrow. Here are what one of Judi Dench’s experts called arboroglyphs (a great word for man-made tree carvings). As directed, I take a right at the four forks and trip under the railway to Dysart, ‘claustrophobic’ (as described by the Walk Highlands website) or idyllic, depending on your outlook. Here I saw ancient mariners in their wee huts flying the Scottish ensign; a handsome harbour master’s house (much mentioned as it is the official Fife Coastal Path headquarters but shut today despite the number of hikers and it being a weekend). Fishermen busying themselves in and out of their huts. There is a thunder of waves now, and another sculpture made up of wooden uprights in pastel blues and greens of the sea when seen in different lights. A herring gull with a gruesome beakful stands on a wall. A cute looking baby seal stranded on the beach was causing a right to-do. Further on were many slightly incongruous, what I call Narnia lamp posts; gleaming white-washed stepped gabled houses; and I finally got my cup of tea which was a mere £1.50. It came with a sugary round of traditional Scottish shortbread, and I bought a piece of tablet (a sort of hard fudge made here – popular and delicious if you have a sweet tooth) for my daughter. Tea at the Timeless Tearooms. Dysart Tolbooth and Town House: erected in 1576, marking the Burgh’s medieval civic centre. It was originally partly a prison and still retains prisoner’s graffiti. The next part of the path was sodden and my waterproof boots let the cold fluid in. The last remnant of the local coal mine has been left on this part of the Coastal Path as a reminder. The Frances Colliery Memorial, dedicated to the men and women who ‘wrocht’ (worked) there. Known locally as ‘The Dubbie’ because it stood above the Dubbie Braes (a brae is a steep bank or hillside). Down a flight of steps I joined the very attractively stacked West Wemyss, and on the way in I passed another castle, this time with blue conical Chinese-looking hats atop its turrets. Behind the walls was an impressive hidden garden glimpsed through cracks. In the misty distance I spied Berwick Law (a low, lone peak in East Lothian- too far away for the camera to pick it up). West Wemyss beyond the magnificent sandstone boulders. The gulls breasts, like waiters’ bibs, caught the sun. The area has been decorated with lottery money and spring bulbs are starting to push upwards. Next time I plan to visit the Community Pub. The tide was now crashing against the rocks and on the shingled and seeweed-covered shore there were more wonderful pinky orange rocks (colour-matched in the clouds). The words ‘gentle’ and ‘benign’ came to mind as I enjoyed their appearance in the glowing late afternoon sun. It was really so very pleasant. The Belvedere Miner’s Institute and Reading Room. 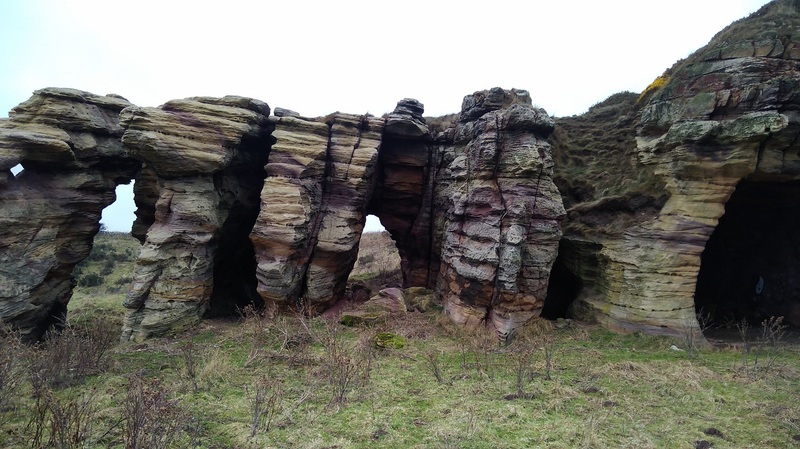 Here you can see the same gorgeous stone (above) used for building West Wemyss. A coven of black cormorants, one with its familiar, jagged outstretched wings gathered at the end of the pier (blurry with the zoom). Do not turn off the path as soon as you arrive. Instead, stay on until you find Back Dykes (as I did not) on your left. At the end of that road turn left onto Main Street and then take an immediate right onto School Wynd. The bus stop is past the Primary School on the same side of the A955 High Road. If you are not sure, everyone is friendly and helpful, so ask. On the Stagecoach bus it took 15 minutes to get to Kirkcaldy, where it took me 3 hours to walk, and I drove home into the sunset, crossing the new Forth Road Bridge as the moon rose. In case it is of use: for this cold January walk I wore long-legged thermals under thin jersey trousers with an elasticated waist (easy to pull up and down quickly when needed), my double layered walking socks (invaluable for avoiding blisters), a vest top, cotton long-sleeved blouse (better for the sweatiness), under a walking hoodie and jacket with a hat, gloves and scarf. I was cool enough what with all the movement, but also protected from the weather. Oh, and I had my sturdy boots on (thanks again, Sabine). Stagecoach buses: £10 one way, £10.70 for all day and any bus. Buy on the bus or via the app. The journey takes 1.5 hrs Edinburgh to Burntisland with a change at Inverkeithing (which is why I took the train in the morning). In the evening the 16.03 from East Wemyss arrived at 17.15 in Edinburgh, and there were heated seats, wifi, a place to charge your phone, and a toilet. All 3 drivers I spoke to, though helpful, were very abrupt. Timeless Tearooms, Dysart near the Tolbooth (no website). Not perfectly clean but there is a decent toilet, the staff were very friendly and helpful (she lent me a device so I could charge my phone while I drank). It was full of locals having a chat and crocheting, and there was a nice atmosphere and a good cup of tea. There are other cafes open in the summer season. http://www.fifecoastalpath.co.uk/ This is the official Fife Coastal Path website, with the circular blue, yellow and green sign which is used to show the way. It has interesting facts but no detailed directions so I did not find it as useful as the Walk Highlands one below. Also the 2 websites divide the walk into different stages. 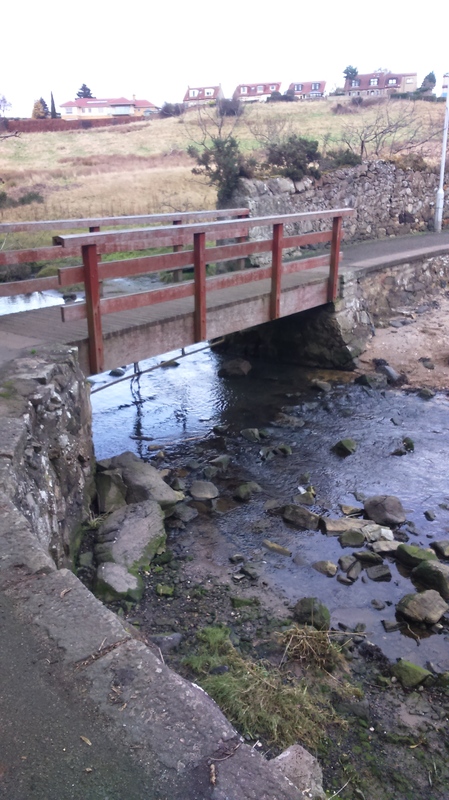 https://www.walkhighlands.co.uk/fife-stirling/fife-coastal-path.shtml Walk Highlands has much more useful information. You have to register and they ask you to say which is your favourite mountain etc, but they have good downloads of maps. The directions for this walk are beside photos and so had to be cut and pasted into a hand-made doc/pdf (which I am happy to send you (www.tamsinlgrainger@gmail.com). 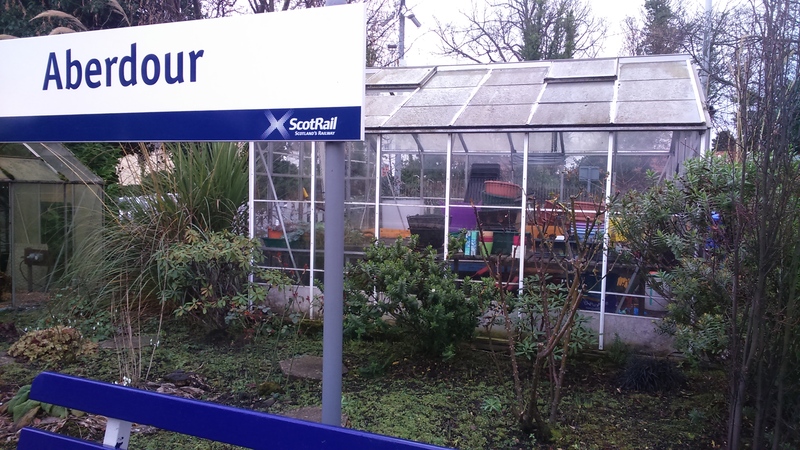 The journey from Edinburgh to Aberdour takes 31 minutes and it cost me £5.35 return (I have a Scotrail Over 50s card). What a bargain! 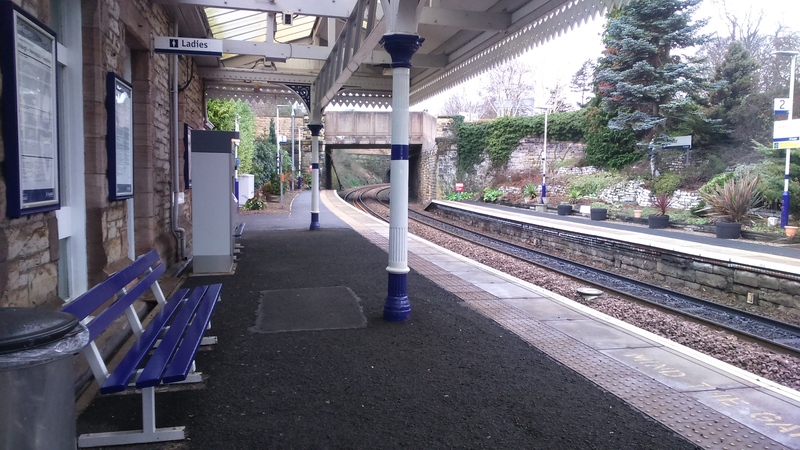 Aberdour station has won many ‘best kept station’ awards. It is all co-ordinated in blue and white. 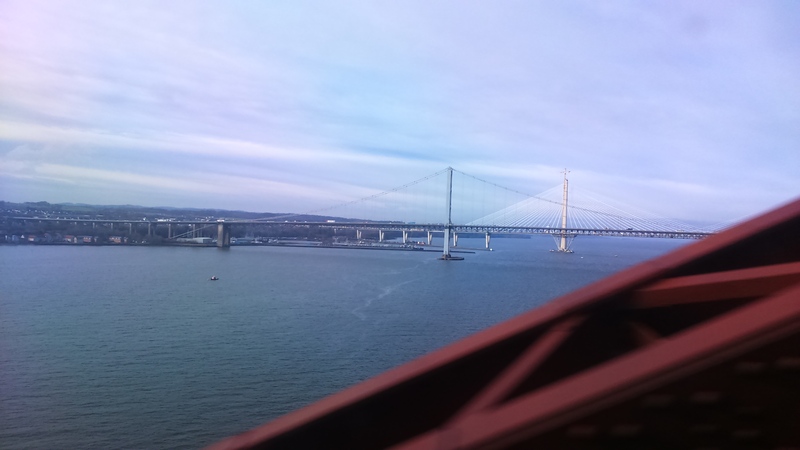 There was the new Forth Road bridge in all its glory! A yellow crane stood beside each of the uprights, and it was teeming with vehicles, and people in high-vis jackets! It’s a bonny sight, and takes the number of crossings to three: the red rail bridge, buxom and with a reputation for needing a new coat every year; the old road bridge, swanky but showing signs of age; and now the elegant, silver-white virgin, as yet untouched. They all, more or less, connect South Queensferry to North Queensferry, and the views are impressive. There used to be a train which trundled along where Lower Granton Road is now, taking passengers and goods to Fife, Dundee and beyond. It rolled onto a large piece of wood with rails, floating in Granton Harbour, and was sailed across to Fife, before it drove off and up north without anyone having to get out. How clever is that?! On the other side of the blue water, the white things all in a line, are the yachts in the harbour. 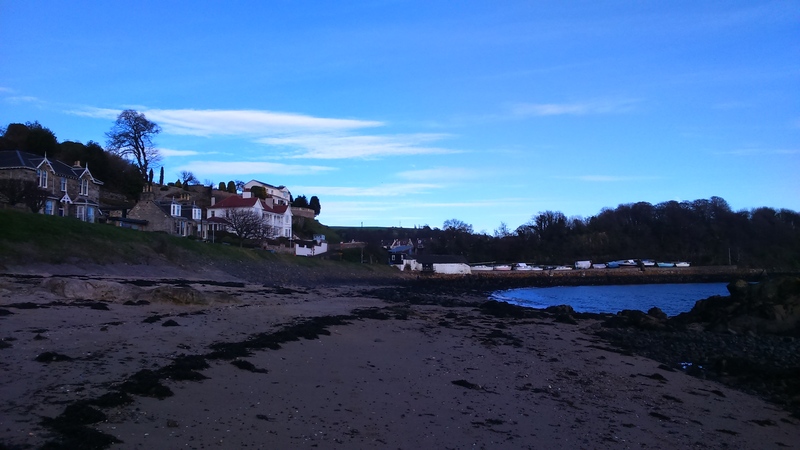 Aberdour is an historic village in Fife – pretty, well-off, and you can see my flat from its sands. 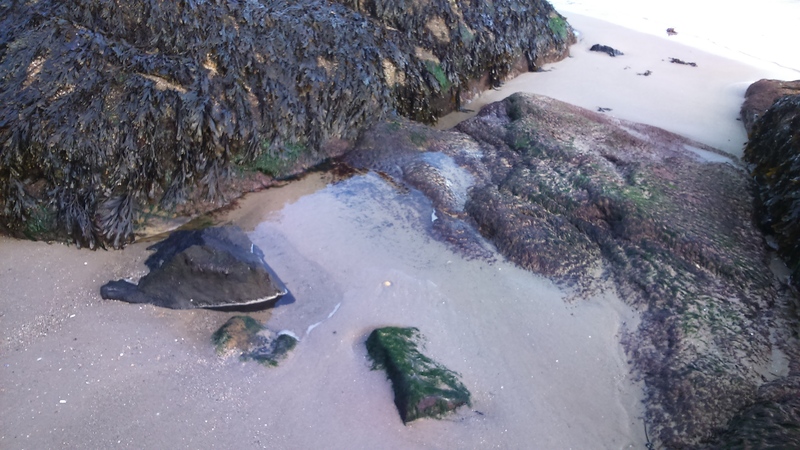 After work, I walked down to the beach and wandered east amongst the seaweed and rock pools (approx. 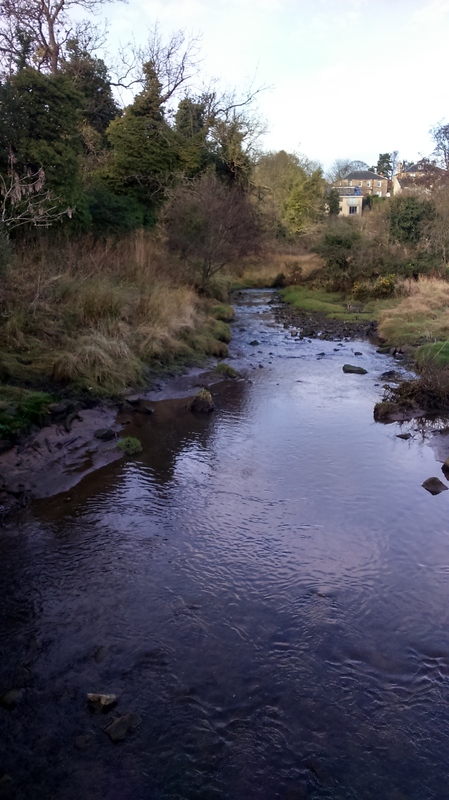 5 mins) smiling at dog walkers as I went; and then west to where the boats are moored, across the wonderfully named ‘Dour Burn’ (‘dour’ means ‘relentlessly severe, stern, or gloomy in manner or appearance’, and a ‘burn’ is a small river or stream) on the wee brown bridge. From there I joined the Fife Coastal Path onto the headland and around to the next bay. I am definitely coming back to walk that Path when I have time. You will need proper boots as it is a steep, slippery climb. There’s a municipal tourist board to help you identify the islands and hills you can see across the water, including Arthur’s Seat, Salisbury Crags, the islands of Inchcolm (the one with the Abbey), Cramond (the one you can get stranded on if the sea covers the crossing before you get back), and Inchmickery. Apparently it is the latter which was said to resemble a battleship to scare off invaders during the war, although I thought it was Inchkieth (the one I can see from my yoga class and front room). This is the first walk I have had outside Edinburgh city since I returned from Yalding (Kent) where I spent New Year. 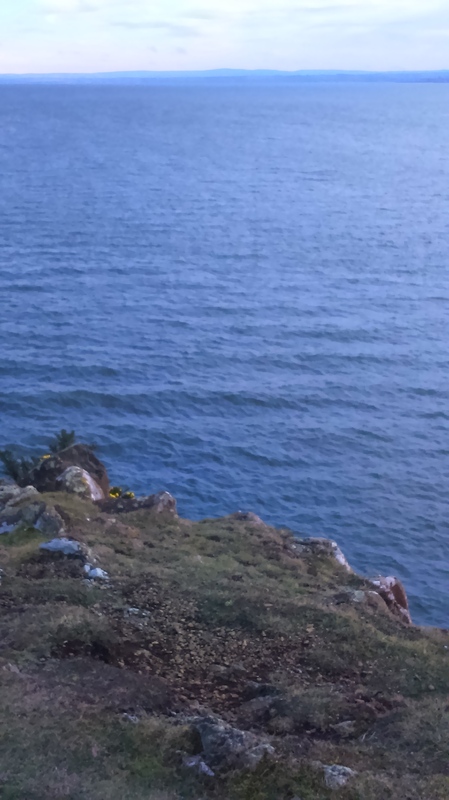 First I got the scent of the sea, the sea plants, and the sand in my sinuses, and they cleared (fantastic after my cold); then, as I walked slightly inland, the whiff of the newly disturbed earth and the wet bracken. My respiratory system sighed with joyful relief! This morning’s hard frost had given way to a warmer 7 degrees by early afternoon. Everyone was very friendly. There were helpful directions, and a Scottish version of ‘Buen Camino’. ‘Enjoy your walk, she said, smiling. I have a fear of going the wrong way. I think it is because I never have enough time and so do not want to waste what I do have. 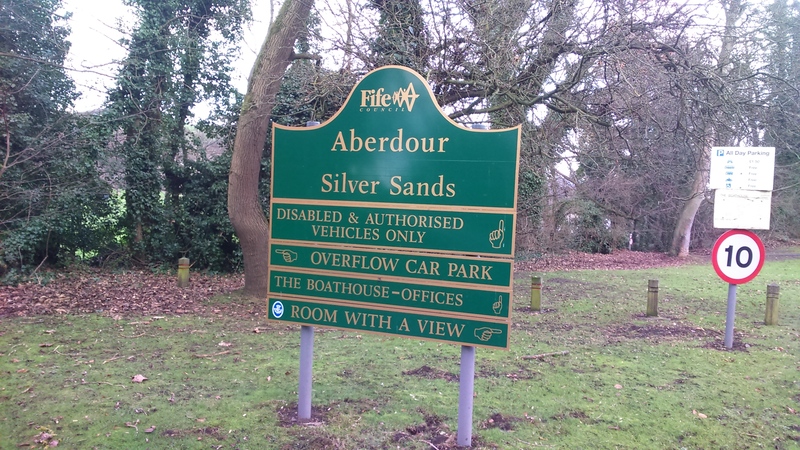 As it was I ended up at the ‘Silver Sands’ car park twice. I spotted a bird of prey I could not identify. I kept seeing an unusually long body part as it turned around on the air current (neck? legs?) and hovvered in the sky above. I asked a man with binoculars and he kindly told me the difference between a sparrow hawk (red tummy), buzzard (‘very large’), and kestrel (pointed wings). I am still not sure what I saw, but it was the size of a large gull. He drew out his camera and sifted through several 100 photos before showing me a gorgeous picture of a robin silhouetted against a dramatic sky whilst perching on his hand (which, he explained, was poking outside the car window) . 2.30pm. It is February after all! 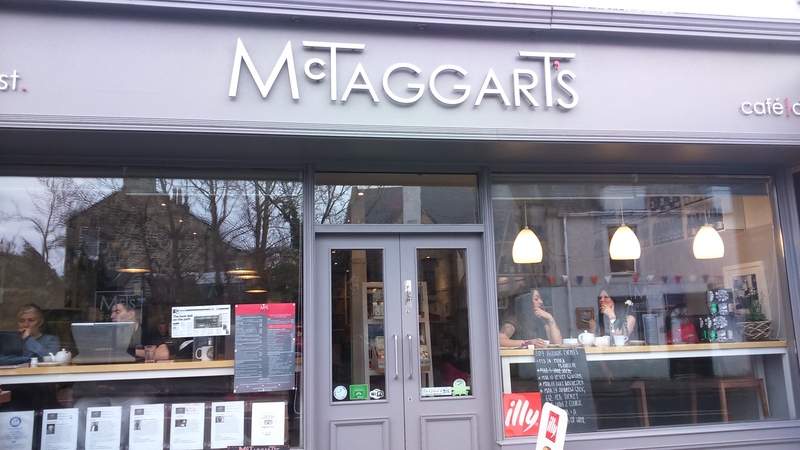 I enjoyed a green tea and scone at the McTaggarts Cafe (was that where I lost my keys?). Good service, delicious cakes, WiFi – recommended. Here’s another shot or two of the station. Only I can wax lyrical about a station, but it is so pretty. 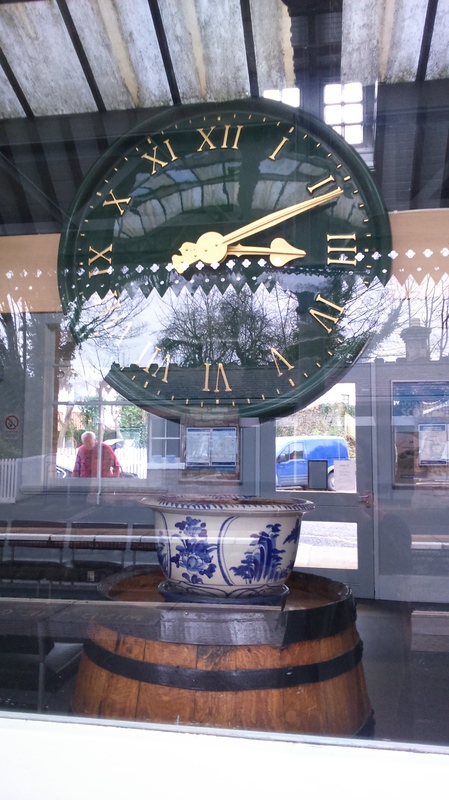 And it’s got a blue and white pot on a barrel (almost like a museum-exhibit, it could have come from friend Lesley’s kitchen), a most interesting clock, and a greenhouse. I have never seen a station with a greenhouse before. The man in red (can you spot him?) was potting up the containers while I waited for the 3.15. 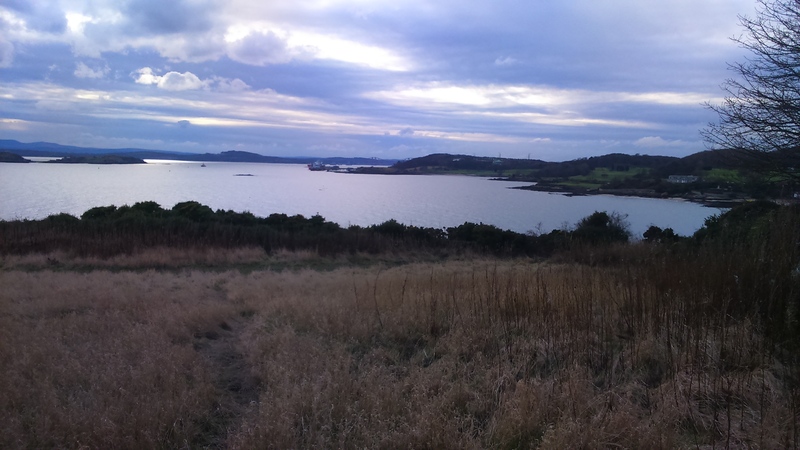 There is more to Aberdour than I that. There is a castle, at least one church, an obelisk, and a shinty club, so I recommend you stay there for a couple of nights. I gave a very enjoyable Shiatsu to a client after my return (or did the keys drop out of my pocket on the train? ), and then I had my second walk of the day. It was raining heavily all through the 50 minutes it takes to get home, indeed my shoes and coat are steaming on the radiator as I write. My toes got wet as I traipsed the first few streets, and the pools of water in my trainers had spread to my insteps by Stockbridge. Eventually my heels were soaking too – that was when I was passing the Botanics – but inexplicably they were still warm. And what a lovely walk it was. I had loads of creative ideas (eg I decided what my book is going to be about, and I came up with an alternative topic for the Eastwood House residential), and even if I do not get my keys back I will manage somehow. There are no photos of this walk as it was dark, but I will take the opportunity to moan about the lack of street lighting, especially on Doune Terrace and Gloucester Street. And I will leave you with the last, lovely photo of the beautiful, blue, Firth of Forth. Sweet dreams!